Blank discs for engraving There are 6 products. 19mm (3/4") solid brass disc tags are small identifying tags. These can be engraved or stamped if you have the correct tools. 19mm (3/4") nickel plated brass disc tags are small identifying tags. These can be engraved or stamped if you have the correct tools. 25mm (1") solid brass disc tags are medium sized identifying tags. These can be engraved or stamped if you have the correct tools. 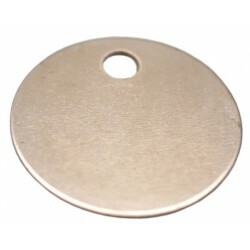 25mm (1") nickel plated brass disc tags are medium sized ID tags. These can be engraved or stamped if you have the correct tools. 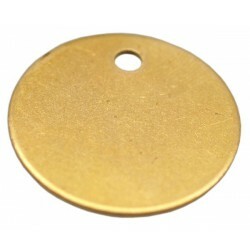 32mm (1.1/4") solid brass disc tags are medium sized identifying tags. These can be engraved or stamped if you have the correct tools. This is our most popular sized discs. 32mm (1.1/4") nickel plated brass disc tags are medium sized identifying tags. These can be engraved or stamped if you have the correct tools. This is our most popular sized discs.